SpaceX's Grasshopper vertical takeoff and landing test vehicle (VTVL) hops nearly two stories (17.7 feet/5.4 meters) during a Nov. 1, 2012 test flight. A reusable rocket prototype built by the private spaceflight company SpaceX has made its highest flight yet, a two-story test hop, as part of an ambitious project to develop completely reusable rockets and spaceships. SpaceX's Grasshopper reusable rocket is a 10-story-tall test vehicle for vertical launch and landing, meaning rockets could not only lift straight up into the sky, but return down to Earth the same way, gently touching down on land when the mission is completed. 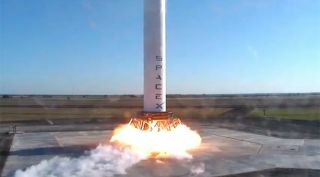 Grasshopper consists of a Falcon 9 rocket first stage, Merlin 1D engine, four steel landing legs with hydraulic dampers, and a steel support structure. For a sense of its scale, note the blue pick-up truck to the left of Grasshopper in the photo above. For Grasshopper's second test flight, the vehicle hopped nearly two stories (17.7 feet, or 5.4 meters), and then touched down safely on its launch pad. The test, which lasted 8 seconds, took place at SpaceX's rocket testing facility in McGregor, Tex., on Nov. 1. No complete rocket has ever landed intact after launching to space.While NASA's space shuttle orbiters were reusable — the winged space planes glided back to Earth and landed on runways — the solid rocket boosters and external tank that helped them reach orbit were not fully recyclable. Grasshopper includes the first stage of SpaceX's Falcon 9 rocket, which launched the company's unmanned Dragon capsule to the International Space Station twice this year. That full rocket includes two stages and stands nearly 227 feet tall (70 meters). The Grasshopper test vehicle also carries a SpaceX Merlin-1D engine, four steel landing legs, and a steel support structure. SpaceX's first Grasshopper test flight occurred Sept. 21, when the vehicle made a 6-foot hop before landing safely on the ground. Another test jump is planned soon, to take the vehicle up 100 feet (33 meters) and back down. The project is part of the commercial space firm's ultimate goal of making space launches cheaper by creating the first fully reusable spacecraft. SpaceX founder Elon Musk first announced the plan in September 2011. "SpaceX believes that developing vehicles that are fully and rapidly reusable is a key element to radically reducing cost and increasing the efficiency of spaceflight," SpaceX spokeswoman Katherine Nelson told SPACE.com. Ultimately, SpaceX envisions using three recyclable components to travel to space: a rocket first stage, a rocket second stage, and a cone-shaped space capsule. Each component would return separately to Earth and touch down safely on land to be refurbished for future missions. (Landing on land rather than at sea is preferable, because salt water makes it harder to reuse hardware). SpaceX intends its capsule to use parachutes to cushion its landing, but the rocket stages will have engines to control their flights back down.